Please note that the getting snow and giving thanks have NADA to do with one another. Sure I may have the flu and have been stuck at home with a sick child all week, but I am not that delusional! 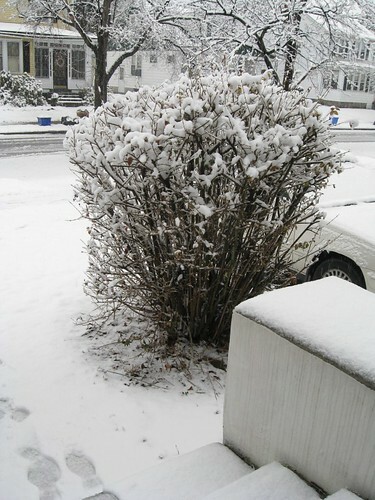 Now that that is cleared up here are some photos from outside just minutes ago. Clearly someone did NOT get the memo that it is SPRING already. Hello – stop with the cold, snow, ice, and other non-spring precipitation and weather patterns. Sickies are done with this garbage and have put it out on the curb with the rest of the trash that went out last night. Now onto the good stuff. I would like to send out some thanks for some packages that arrived here this week from giveaways that I won. 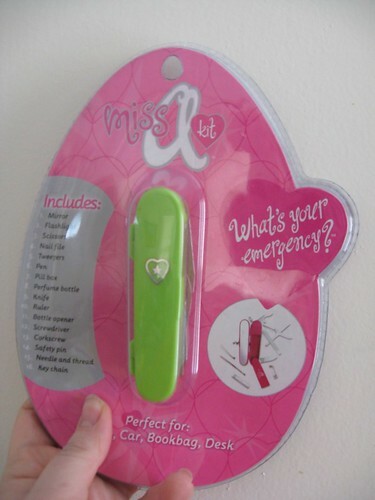 I won this from Candi at ~~All Day Night~~ as her entry in the Ultimate Blog Party. Thank you so much Candi – I love it and it will come in handy in my diaper bag for emergency Mommy situations! The Ultimate Blog Party was so much fun. I was lucky enough to find Candi’s blog and am now a daily reader. She is the Mommy of two little boys who are very close in age to my little guys. Stop over and say hello to Candi when you have some time. Yesterday as the boys were getting antsy another package came. 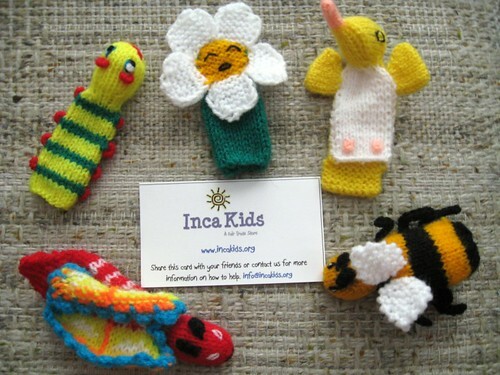 Inside was my giveaway from Momsational: I had won a set of fair trade Peruvian Finger Puppets from Inca Kids. They are absolutely amazing. I can not believe that people and not machines knitted these little guys. Here are a few photos so you can check them out. Here is one side on my hand. . .
And now the other side. . . Thank you again to both ~~All Night Day~~ and Momsational for the fun giveaways!! Oh and please tell the snow to GO AWAY and take the sickies with you. « Fevers, coughs, nebulizers and the flu – oh my! Those finger puppets are absolutely adorable! I love the butterfly – so colorful! Cute, cute! Congrats on your wins! That MissAKit tool looks neat. Have you used it yet? Elaine: They really really are cute. I knew they would be great from the website, but they were so much more when I had them in front of me. Stephanie: Thanks! No, I have not had a chance to use it yet. With the ongoing battle of the flu we have not been out of the house, so it has not come out of the package yet. If I feel better later today I plan on taking it out to play. If you’re looking for slightly less technical editing ability, check out Picnik (http://www.picnik.com/) and Picasa (http://picasa.google.com/). I’m a grad student and can’t afford PS, so I love free programs, and those are two of the best I’ve found. 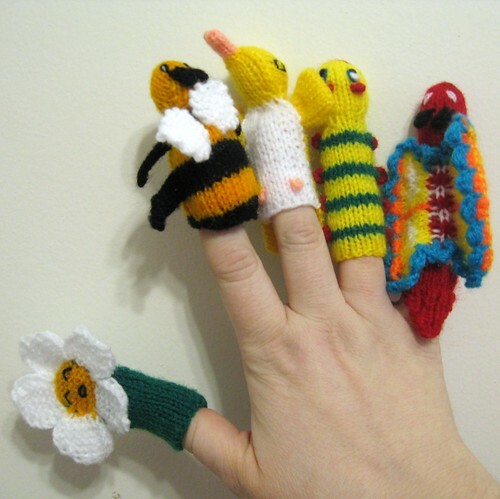 Those finger puppets are so cute. On my way over to try and get me some! ashpags: Thanks for stopping by my blog. I caught what you wrote on OMSH’s page and will definitely look into the photo editing tool that you mentioned. Wow, 80 degrees! Although I would love some warmth, I do not want to require the AC units just yet. 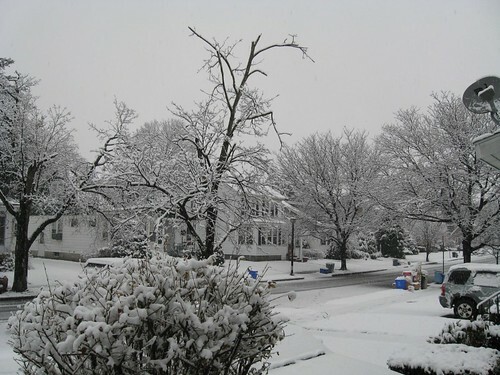 Mommyknows: Hoping that spring will arrive this week, but not holding my breath. I think we are supposed to get to 60 tomorrow, but of course that was after low 30’s this morning. The finger puppets are amazing and there are so many to pick from. Keep me posted on which ones you select. :-) Glad you like the MissAKit. I found mine a few years ago and love it so much!! 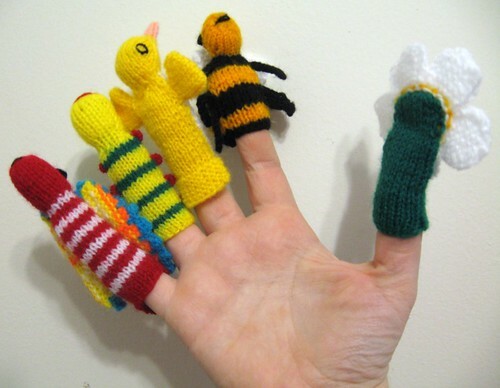 Those finger puppets are AMAZING!! Super, super cute! Candi: I opened up the MissAKit this weekend and it is so neat. There are just so many possibilities. It will certainly come in handy in the diaper bag. Thank you again.